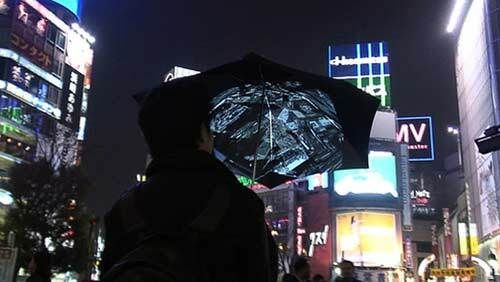 As you’ll see from the photo, the Pileus umbrella is essentially a large screen on the inside of the brolly canopy that displays whatever is thrown onto it by a projector in the shaft. Those images come from a connected laptop PC that uses a Wi-Fi connection to get online. Other hardware in the device includes a camera, a motion sensor, a digital compass and a GPS receiver. Currently, Pileus draws its various elements together in two functions – 3D mapping and photo-sharing. The mapping is powered by Google Earth to create a view on the umbrella of the immediate surroundings, which the internet connection updates in real time. Should virtually exploring the real world prove tiresome, a flick of a switch activates the camera, which takes snaps that are uploaded to Flickr in an effort to make sharing a stroll (presumably in the rain) with the rest of the world effortless. Lastly – if all that isn’t enough – the Pileus can pull slideshows and videos from the ‘net for a spot of more prosaic idling under cover. Although the concepts behind the internet umbrella might sound a little trivial – not to mention pointless – at first glance, there’s no denying that it’s outside-the-box thinking like this that will guide how we use the myriad of technologies at our fingertips in future.